Hidden away within a quiet industrial suburb on the beautiful Gold Coast, lies an Art Gallery filled with unbelievable pieces of handmade glass art.. Here at the Glass Xpressions Art Gallery and Studio, pieces on display include a vast array of styles, designs as well as sizes, all crafted by our expert team of artists here on the premises. Glass is still considered to be a luxury material and rightfully so, with its transparent glaze finish, glass can be formed or moulded to incorporate any pattern or design you can dream of. 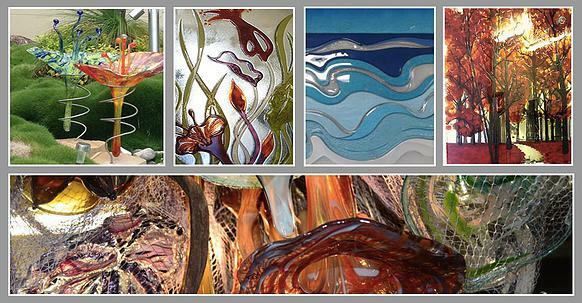 From wall hung glass art, sculptural pieces, stunning glass platters and amazing glass chandeliers, the Glass Xpressions Art Gallery is like no other gallery collection you’ve seen before. Our team of artists here at the gallery can also be commissioned to create the perfect piece, just for you. This way you can have complete ownership over your new piece of artwork as we can incorporate your choice of colours, patterns and imagery into the piece. We are experts in textured and patterned glass, hand painted glass finishes, and slumped glass. We house 5 kilns of various sizes, therefore we are able to create the largest pieces of glass art possible to suit your space. You can be sure if we cant do it no one can!!. So why not visit our Gold Coast Art Gallery and Studio today, to realise the endless possibilities of Glass Art.